Following the morning lecture at SEA Junction on 13 August 2017 by two graphic experts on the contemporaneity of decorative motifs and designs at Wat Yai Suwannaram Temple in Petchaburi Province, a related workshop will be held in the afternoon at the same venue by one of the speakers, former stylist and Thai art designer Kwanpoom Vilaival. The workshop, which is open to both adolescents and adults, aims to teach how to apply the traditional motifs of the late Ayutthaya period to modern cotton products such as T-shirts and bags. According to the description by the Thai Tourism Authority: “Wat Yai Suwannaram Temple, featuring a windowless main shrine hall, houses magnificent 300-year-old murals of mythical angels. Its Sala Kanprian (multi-purpose hall), which was once located in Ayutthaya’s Grand Palace, was entirely built of teakwood and decorated with fine woodwork especially at the door panels. There is also a preaching throne with magnificently elaborated Bangkok style woodcarvings and gold gilt works”. Here is where the most interesting collection of stencil patterns done with paper-block printing can be found in Thailand. This technique is common among artisans all over the world and it has been used thousand years ago in China and at least half a millennium ago in Japan. The temple’s vigorous patterns remain a source of creativity to these days and continue to inspire new designs based on them. 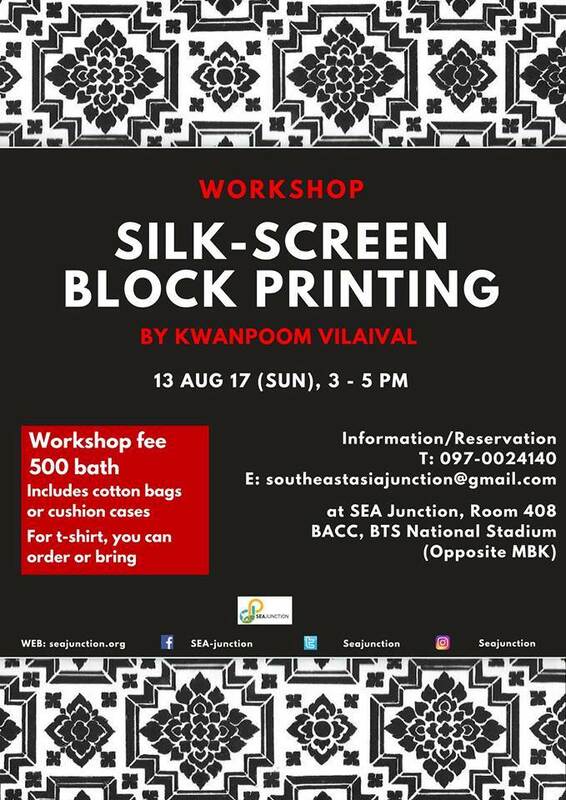 During the workshop, Kwanpoom Vilaival will share some of these designs and participants will learn how to apply them using silk-screen block printing, a technique that is very close to the traditional paper-block printing, but more practical and neat. Participants will learn about paper-block printing and silk-screen printing as well as about traditional ornaments and contemporary adaptations and will practice using them. They will be able to choose between cotton bags or cotton cushion covers for their designs. White T-shirt can also be ordered in advance or otherwise brought by the participants themselves so as to ensure that it is the correct size. Other material can be proposed, again in advance to check if feasible. The workshop will be given by Kwanpoom Vilaiwan from Artizaan Press who learned art design with masters Pairoj Teeraprapa, M.L. Chiratorn Chirapravati and Prof. Prateep Sawangsuk at Siam Sarm Tri Schools. He has experience in publication, design work, and fine art painting. He founded Artizaan Press and has edited more than 10 books, and 100 pieces of publication including, academic journals, chart books, scrapbooks and greeting cards from the work of famous Thai artists. His design work is both for commercial and non-profit aims including for supporting HIV patients from the Thai Red Cross, and for Bangkok National Museum, and Museum Siam. He gives workshops on silk-screen printing on cotton using gold stencil patterns inspired by Wat Yai Suwannaram temple. In his design work, the dominant color is the ‘Indian Red’ from soil pigment, which has been used since prehistoric times in Petchaburi province, including in the temple. He has also written and printed books in Thai about the temple’s designs. The cost for the workshop is TBH 500 including materials. For participants who bring a T-shirt by themselves the price will be TBH 400.